The FCC is looking to obtain more information from T-Mobile, AT&T and Comcast about plans they offer consumers allowing them to stream music and video without it counting against their monthly data allowance. 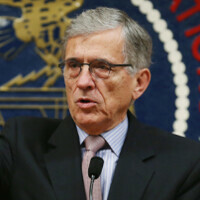 FCC Chairman Tom Wheeler disclosed at a press conference earlier today, that the agency sent out letters to the three companies asking them to respond to its questions by January 15th, 2016. Wheeler noted that the letters sent out by the FCC have nothing to do with an investigation or enforcement action. The FCC Chairman said that the letters were sent just so the agency can get better informed about the free-streaming promotions. Wheeler said that he just wants to become more educated about the ever-changing industry. T-Mobile's Music Freedom feature allows customers to listen to music streamed from certain apps, without using any of their precious data. The carrier's Binge On offering allows certain subscribers to view their favorite television shows and movies, without using any of their data. AT&T's "Data Perks" rewards customers who view certain promotional videos, with the gift of free additional data. Comcast's StreamOn service allows customers to view video without it counting against their monthly broadband data cap. Known in the industry as "zero rating," some feel that the aforementioned plans result in a bias against smaller carriers who can't afford to offer similar perks to customers. While the FCC could end these practices, it would be hurting consumers who are beginning to get used to not using their data to stream content over their phones or tablets. In fact, the FCC Chairman initially had good words to say about T-Mobile's Binge On, calling the service "innovative." A T-Mobile spokesman responded to Wheeler's comments on Thursday by saying that "the carrier looks forward to talking to the FCC" about Binge On. AT&T said that it is reviewing the FCC's letter and is "committed to innovation without permission and hopes the FCC is, too." Comcast noted that since its Stream TV service doesn't use the public internet pipeline, it can't violate Net Neutrality rules. Still, the cable giant says that it is happy to cooperate with the agency. Meanwhile, securities analyst Paul Gallant of Guggenheim Partners called the FCC's move "an unusually proactive step," pointing out that there have been no complaints made against any of these zero rating services. Gallant believes that Wheeler's comments were meant to be a warning to the carriers not to get too aggressive with these data-free offerings. Since the FCC is from the government, by the government and for the government, I expect it to cater to corporate and congressional interests and to shaft the consumer. I don't think I can express my feelings about the FCC or their ridiculous practices in a positive way, so I'll just say that I'm tired of them.